The appeal in the president’s recent executive order for “free inquiry” and “open debate” at colleges and universities mimics the rhetoric deployed by fascists such as Milo Yiannopoulos and Richard Spencer. Trump’s appeals to “free inquiry” and “open debate” in the executive order mimic the rhetoric deployed by fascists such as Yiannopoulos and Spencer, along with various pundits who criticized student groups that protest fascists on campus. The leadership at public universities where fascists held events in recent years frequently took up the same lines as the far-right about the important of “free speech” and debate. President Trump announced plans at last month’s Conservative Political Action Conference (CPAC) to sign an executive order protecting right-wing activism and organizing at public universities and colleges. Of course, it’s not Trump’s aim to protect free expression on college campuses, but to further empower far-right organizations on college campuses. Trump’s executive order, cheered by anti-choice groups, will have far-reaching consequences at public colleges, including for reproductive rights advocacy. With his latest executive order, the president is handing a victory to reactionary groups that operate on college campuses, groups that have spent the last several years framing protest against them as infringements on their right to free speech. There have long been culture wars waged on U.S. campuses, and the latest wave has brought fascist speakers and organizations—chiefly Milo Yiannopoulos and Richard Spencer. Though the order is light on details, it would be naive to assume this means there won’t be negative consequences for marginalized members of university communities. With the conservative element emboldened at American University, Bovasso said Trump’s campus executive order “could definitely bring out the confidence in those students to [be more vocal],” and she’s worried this could have consequences for reproductive rights organizing at her school. A campus-based reproductive rights organizer, who works with a well-known rights organization at a public university and who asked to keep her identity anonymous, told Rewire.News she doesn’t think things can get much worse. “I think doing this work, there’s a level of soldiering on that’s present all the time,” she said, “and when you’re organizing on a campus, especially one that has as active a right-wing student element as ours, you just kind of get used to the expectation of harassment.” The organizer said she has been harassed by members of Turning Point USA and other right-wing organizations for her work on abortion rights. Trump’s appeals to “free inquiry” and “open debate” in the executive order mimic the rhetoric deployed by fascists such as Yiannopoulos and Spencer, along with various pundits who criticized student groups that protest fascists on campus. The leadership at public universities where fascists held events in recent years frequently took up the same lines as the far-right about the important of “free speech” and debate. “The bar on free speech is incredibly high at a university,” former DePaul University president Dennis Holtschneider said in defense of Yiannopoulos’ 2016 visit to the school, which was disrupted by student protesters. There is ample evidence that right-wing students, faculty, and visitors to public colleges already enjoy First Amendment protections (which are not consistently enforced for leftists) when it comes to a range of activism, including the anti-choice variety. For the past several years, the anti-choice organization Created Equal has been allowed to demonstrate on campuses around the United States, including the University of Cincinnati, where the group visited on Wednesday. Created Equal used a Jumbotron to display anti-choice propaganda containing graphic images to recruit students to the anti-choice movement. A Created Equal activist told the Cincinnati Enquirer ahead of the group’s University of Cincinnati demonstration that sparking “debate” on college campuses is part of the strategy to sway public opinion against abortion rights. Asked by Rewire.News for comment about the event and whether Trump’s new executive order weighed in the school’s response to Created Equal’s demonstration, a university representative stressed that their campuses “serve as important forums for the debate of diverse ideas” and reiterated that the school takes its obligation to uphold the First Amendment seriously as part of its academic mission. However, Created Equal was not on campus for a moderated debate, but to display graphic anti-choice propaganda on a Jumbotron. Right-wing student organizations praised the executive order as soon as the president announced it. Students For Life of America president Kristan Hawkins was quoted in a Washington Post article: “Since the election of President Trump, it’s gotten more dangerous on campus. … Those who advocate for legal abortion feel their backs are against the wall. 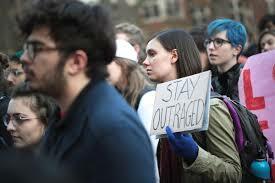 It’s more tense.” Right-wing organizations typically present themselves as having their rights violated when they are protested, when, in fact, a litany of recent and historical examples demonstrate that it is the right that poses a threat to others, both on and off campuses. Hawkins wrote an op-ed in which she argued that attacks on “free speech” were hurting right-wing activists on college campuses, and praised Trump for announcing the new executive order at CPAC. The op-ed lists a few instances in which right-wing student activists were protested for spreading their violent ideology on different college campuses. Hawkins’ op-ed and her remarks quoted in the Washington Postclosely resemble the rhetoric around “free speech” rights that avowed white nationalists have used to defend themselves against protest and scrutiny. When Trump signed the order at the White House last week, he spoke about “truth, justice, and freedom,” but singled out progressive policies some universities have in place. “Under the guise of speech codes and safe spaces and trigger warnings, these universities have tried to restrict free thought, impose total conformity, and shut down the voices of great young Americans,” Trump said. The president invited a number of right-wing students to speak publicly about being protested or simply being asked to follow policies around trigger warnings. Ellie Wittman, one of Trump’s student guests, is the president of Students For Life at Miami University in Ohio. In 2017 she was asked by the university to display content warnings alongside the group’s massive anti-choice display on campus. Right-wing media organizations latched onto the manufactured outrage over the “trigger warning” policy, and Wittman sued her school over being asked to post warning signs or else forgo creating the group’s annual “cemetery of the innocents” display. At the signing ceremony, Wittman claimed that the First Amendment is “under attack” for conservatives on college campuses. Campus-based anti-choice organizations such as Students For Life consider the executive order a win. Others who have praised the new order include Jerry Falwell Jr., a Trump loyalist and president of the private evangelical college Liberty University—Falwell has been accused of censoring student journalists at his own school—and Turning Point USA (TPUSA) president Charlie Kirk. Kirk, whose organization is funded by dark money and has some connections to fascist organizations, has been at the forefront of the right-wing “free speech” on campus brigade. The decision to issue this executive order seems to have been inspired in part by TPUSA’s activism. When Trump announced the order during his speech at CPAC, he invited onstage a TPUSA member who was allegedly assaulted while recruiting for the far-right group at University of California, Berkeley. The president neglected to mention the numerous occasions in which supporters of far-right speakers visiting college campuses physically attacked counter-protesters. One of these far-right attackers, Tyler Tenbrink, was sentenced to prison for firing a gun into a crowd of people protesting against Spencer’s appearance at the University of Florida in 2017. He was sentenced to prison on February 27, the same day CPAC kicked off. There are no attacks on the free speech rights of conservatives. Rather, the right wing is continuing to stifle dissent so that dangerous reactionary elements are allowed to spread uncontested. Right-wing appeals to free speech have proven time and again to be nothing more than a disingenuous and cynical cover for eroding the right of others to dissent and organize around human rights at school. Of course, this executive order did not come out of the blue, and right-wing elements have long been a significant influence on university campuses, even public ones. Reproductive rights organizers on college campuses have been dealing with an empowered anti-choice movement on campus, and some organizers see Trump’s latest executive order as more of a warning than anything else.